· The Japan’s only material store of "Tsumami” transmitted from the Edo Period. 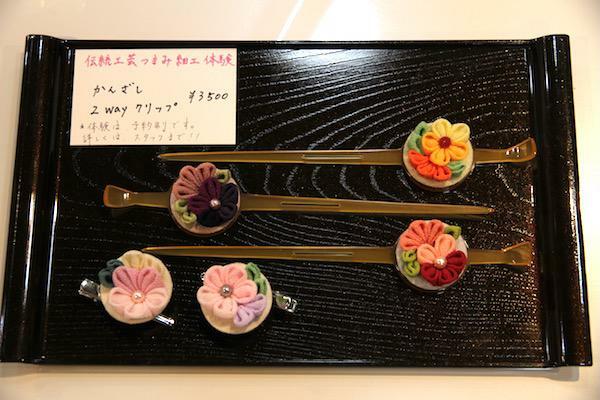 · 90 mitutes Tsumami workshop is available for 3800 yen. Tsumami is a traditional craft that shapes patterns such as flowers and birds by folding and combining thin silk like an origami. 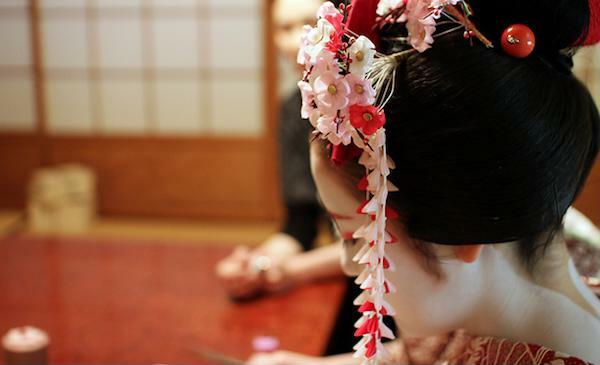 It has been used for long time in honoring Maiko’s hair. The fascination point is a delicate and soft expression of fabric, and colorful combination of color and transparency, due to the use of silk material. 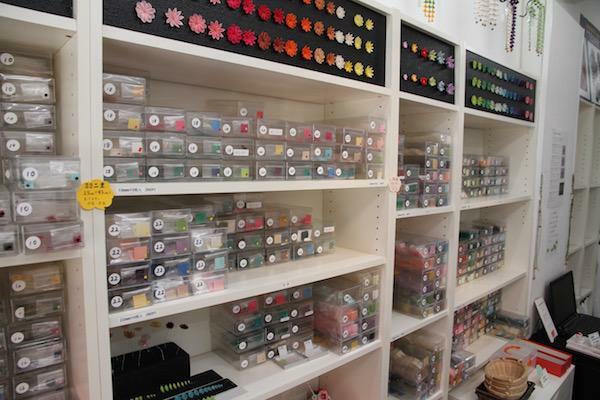 they sell accessories for women such as necklaces, pierced earrings, and cuffs for men, tack pins and so on. These are different from metal accessories, so we will recommend them for those who want to stand out different from others. 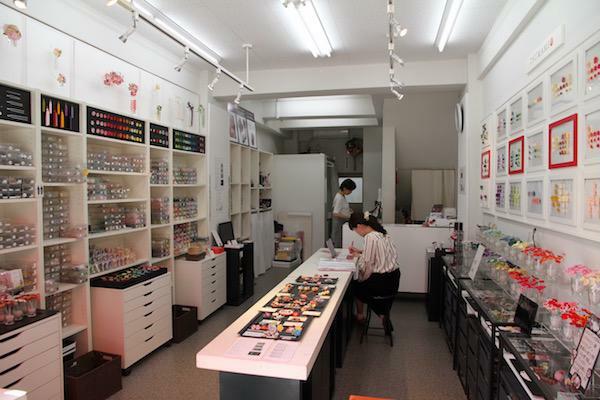 The shop is located in the downtown, along Edo street. 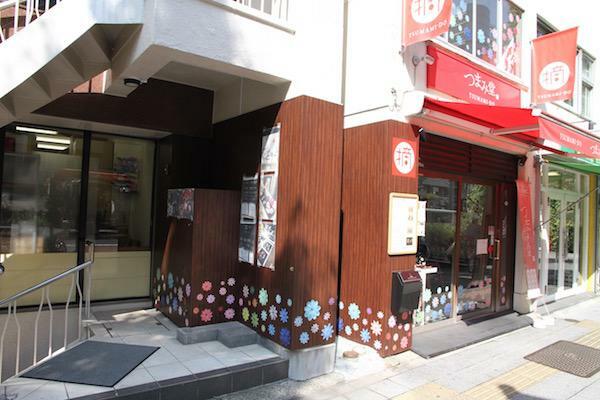 About 6 minutes on foot from Asakusabashi station of JR Sobu line or Toei Shinjuku line. And it is about 10 minutes on foot from Kuramae station of the Toei Oedo line. It has stores divided into two buildings. while on the first basement floor of the next building is an workshop space. 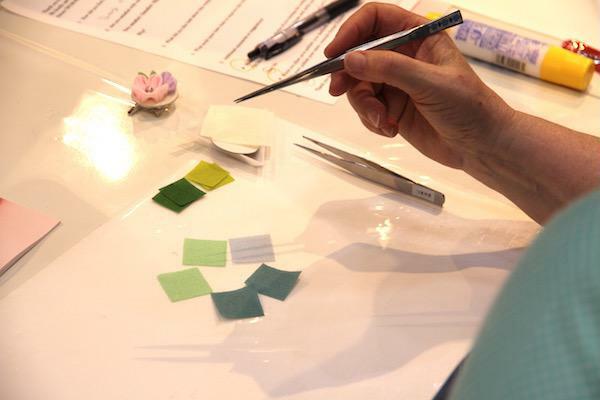 The Tsumami material are mainly cloth pieces of 3 cm square and 2.5 cm square. 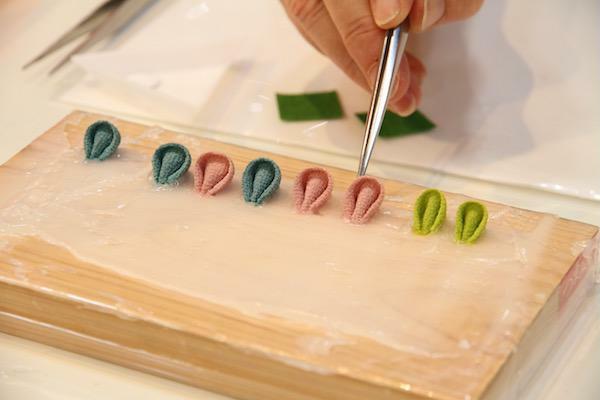 It costs from 200 yen with 10 pieces of silk, and from 160 yen with 10 pieces of Hitokoshi chirimen. It is spectacular to see the cloth of this material lined up on the shelves in color spectral order, so you can also enjoy just by glancing inside the shop. Besides, They sell Tsumami making tools set for 5500 yen and if you like Tsumami making after the workshop, you can buy them to take it home. Tools can be substituted by others, so you can buy only cloth and it’s possible to consult what kind of tools to use. 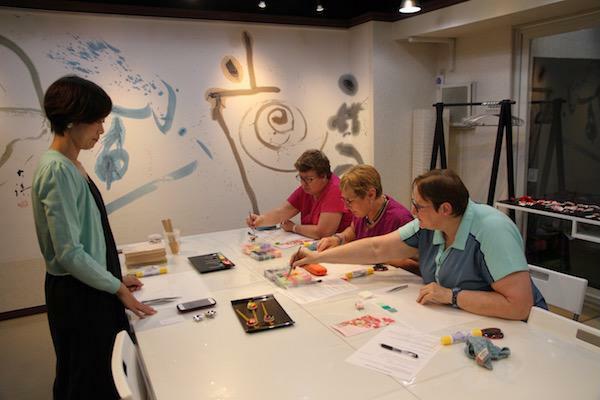 Workshop booking is possible from the website of Tsumamido. The reservation will be through the e-mail address listed on the website, but reservations up to 2 days in advance are required. In addition, for foreigners the workshop can be handled by the only one available english speaking staff, so please refer to the calendar on the site. The price is 3800 yen in about 90 minutes trial. 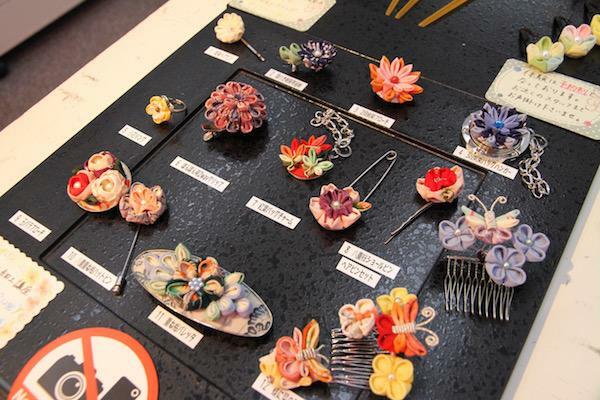 The contents of the trail is about the production of a Kanzashi or brooch with a flower as a motif. 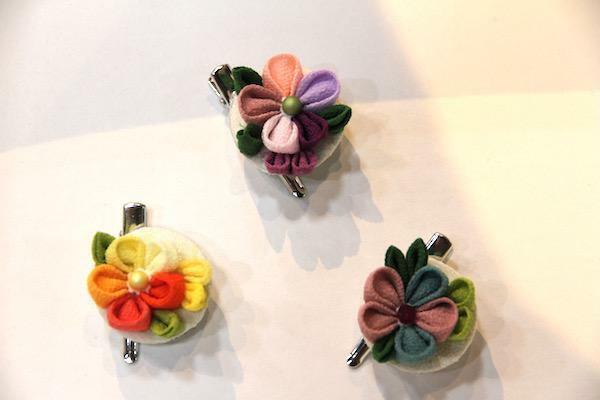 “If we choose brooch, we can use it as scarf clip too”. 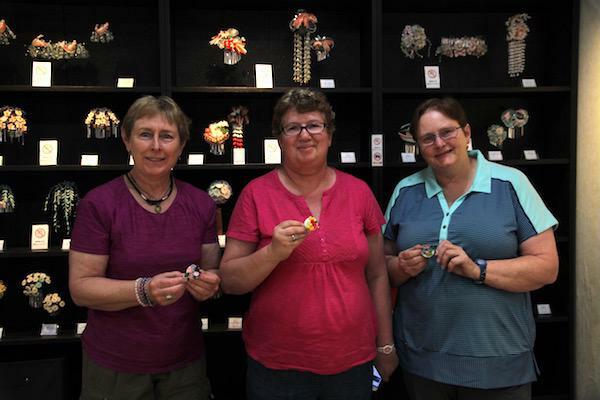 Therefore, this time we report about making of brooches. 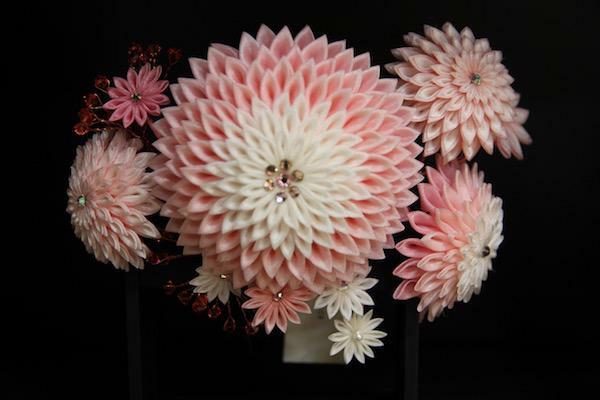 Just choose the colors, make petals, now all left is to assemble them! If you have decided what to make, next to decide is the color of the fabric. At the workshop, type of cloth called “Ichikoshi Chirimen”. 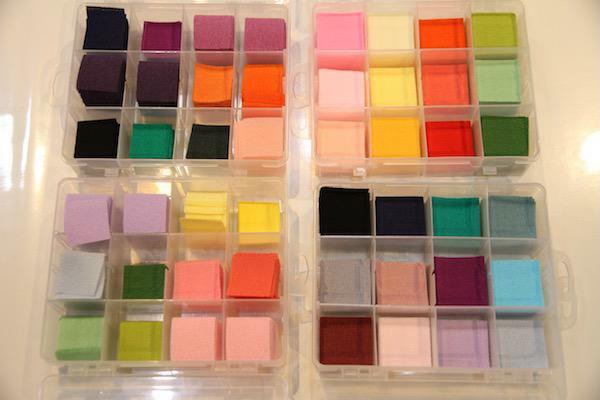 You can choose from 24 different colors for each large and small cloth. The impression of your work will change greatly with this combination, so please think carefully. First you will start by making a rounded “Maru-tsumami". After that, a pointed "Ken-tsumami". Each of the tasks is not so difficult, you will grasp the trick if done several times. 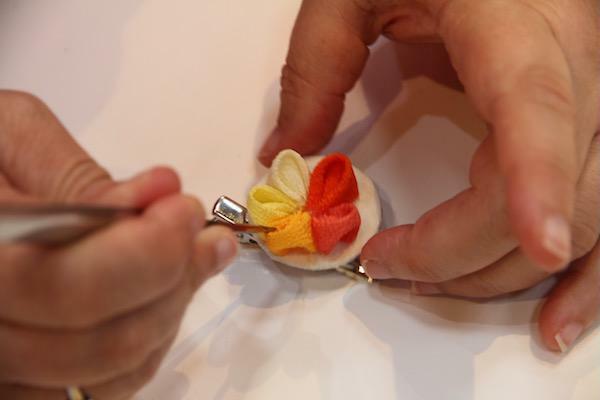 When you fold the cloth like origami, shape it with glue and arrange it on the pedestal part of the brooch. Here also, the interesting part is that one’s individuality comes out with arrangement. The finished product is lightly dried with a hair dryer and they put it in a small paper box one by one. 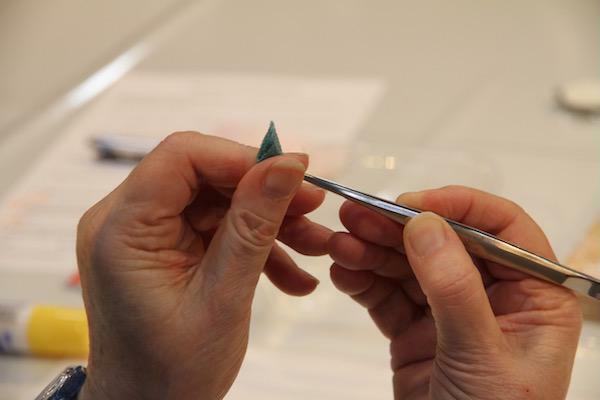 It seems that the glue will take whole day to dry completely, so it must be handled very carefully. This is an experience that you can make delicate personal souvenir which you can’t find elsewhere. So, please try by all means.